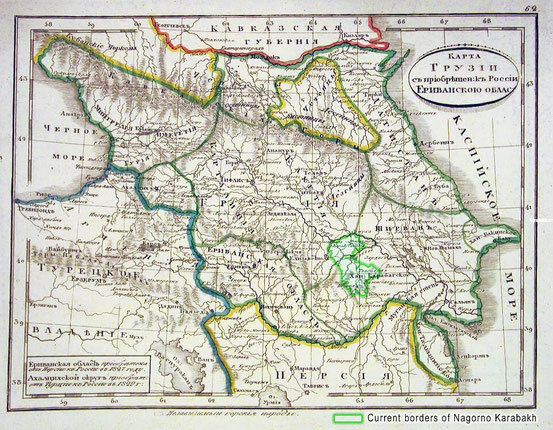 1828: Artsakh became part of Russia. Treaty of Turkmenchay. 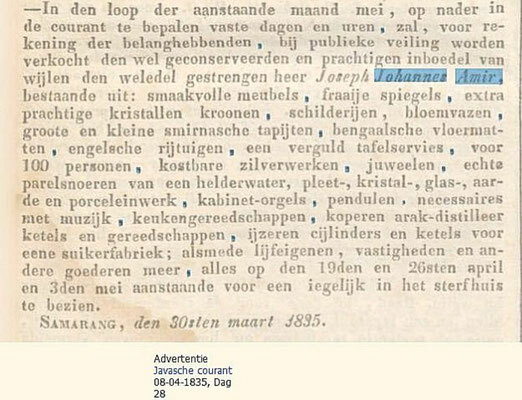 1829: The famous letter of Agha Hovsep. 1835 - 2015: What happened with Agha Hovsep's descendants and his capital? 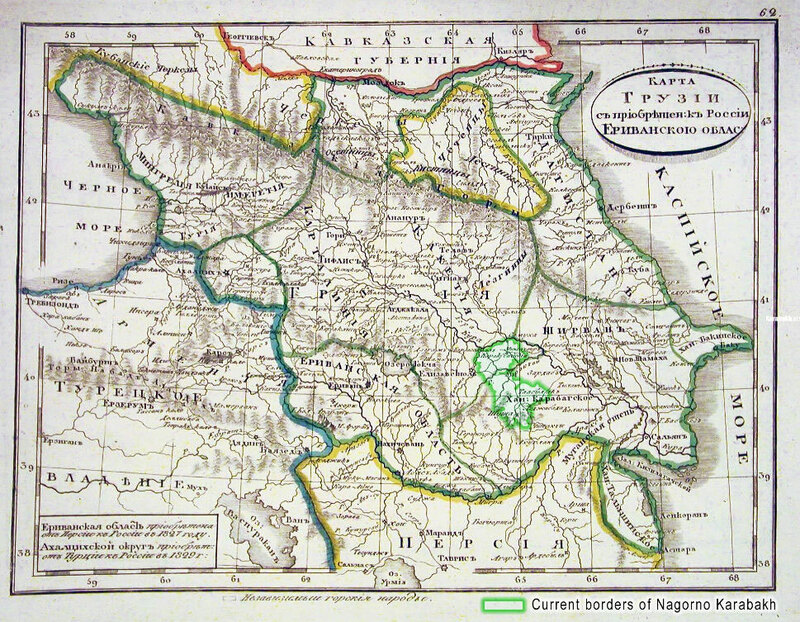 Artsakh in the year 1822. Artsakh became part of Russia in 1828 and the news was spread widely and reached Agha Hovsep. Finally he was able to fulfill his ideal dreams he once made at young age: A free Artsakh. It was then in 1829 that he wrote his famous letter to Nerses Ashtaraketsi dated 20 Oct. 1829. (Khachatur Dadayan started to write the complete serie on 17 July 2015) In his articles one can read about the continuation of the famous letter of Agha Hovsep. The high value of your spirit, your boundless love of our country, the eloquence of your thoughts in doing great tasks over time, and the great services you rendered to our people. You enchanted our hearts in this far away country from a long time ago. I deeply respect you. I wished to talk about my great feelings, but unfortunately I hadn't had this opportunity yet. Now that the letter your holiness wrote to me, stating that I was an Armenian living in India, and reminded me of the cherished luck and happiness awaiting us in details, I have to confess that my wishes came true, and the articles of news were fabulous. Now we are luckier than our ancestors as we are proudly witnessing the testimonials of the dearest thing that can happen to our nation-Freedom. We therefore have this holy duty to offer our profound and heartfelt gratitude to the Russian Tsar who committed to the freedom of our lands rather bravely. The Armenian nation sincerely wishes the benevolent Tsar the best of health and longevity. Life went on for Agha Hovsep and his family and it is the year 1834 in Semarang. David, his first child and eldest son became captain on one of his ships and married in 1834, Frederik Daniel his second child and son followed his footsteps and became a businessman too learning all from his father, his third child and first daughter Johanna married 1834 a Governor called Charles Francois Boudriot originating from France who's ancestors fled to The Netherlands (Hugenots 1564), his fourth child and third son Cornelis Hendrik was still studying as his fifth child and fourth son Hacoob was doing likewise. 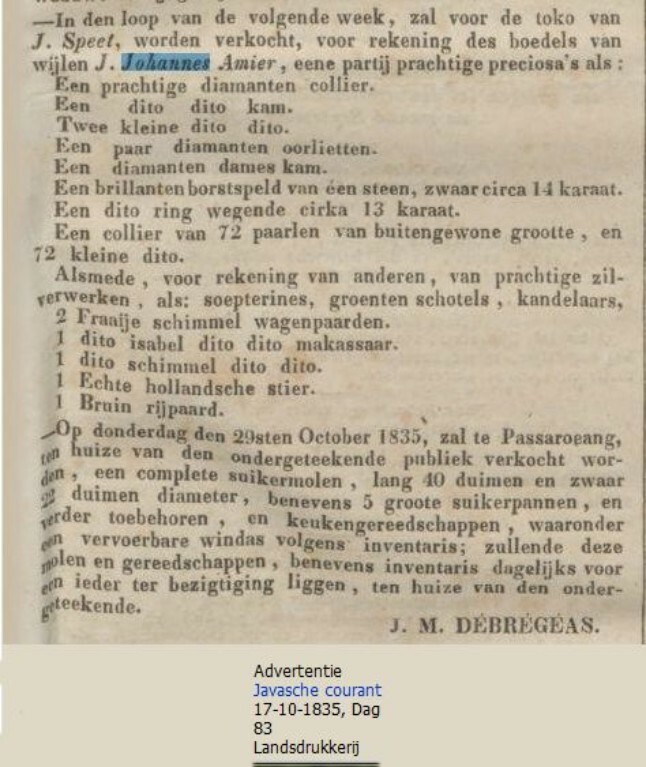 (Hacoob was sent to Europe at age of 15), Geertruida Hermina, Jan Joseph, Wilhelmina Carolina, Anna and Louise Elisabeth varying from 12 to 1 year old, were still at school or being nursed by the maid and enjoyed life in a rich and well respected family. 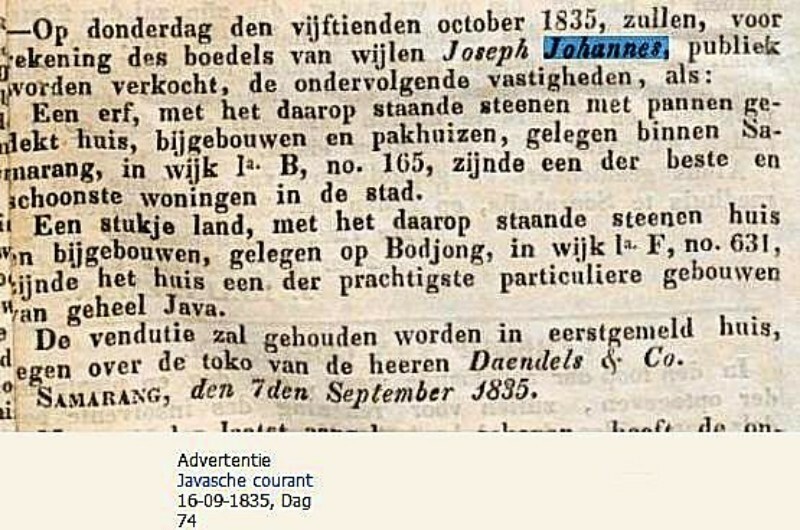 His business were blooming superb, from time to time there were people from New Julfa passing by and informing him about his family and yet Agha Hovsep had his worries and often he went to the "Johannes Berg" and sat down overlooking his land and the Java Sea and he noticed dark clouds rising up from the horizon each time more and more. He worried about Artsakh, he worried about his children as they do not speak his Armenian language, he worried as his sons also did not share his dreams about freeing Artsakh and most of all he was worrying about an upcoming disease, which he nor a doctor could control. David his eldest son who already waited at him for 2 weeks and his tomb was besides Agha Hovsep's tomb. The next morning on the 26th, all came passing by to show their respects to Agha Hovsep's body and to grieve and a Great son of Armenia has travelled to his Lord Almighty. 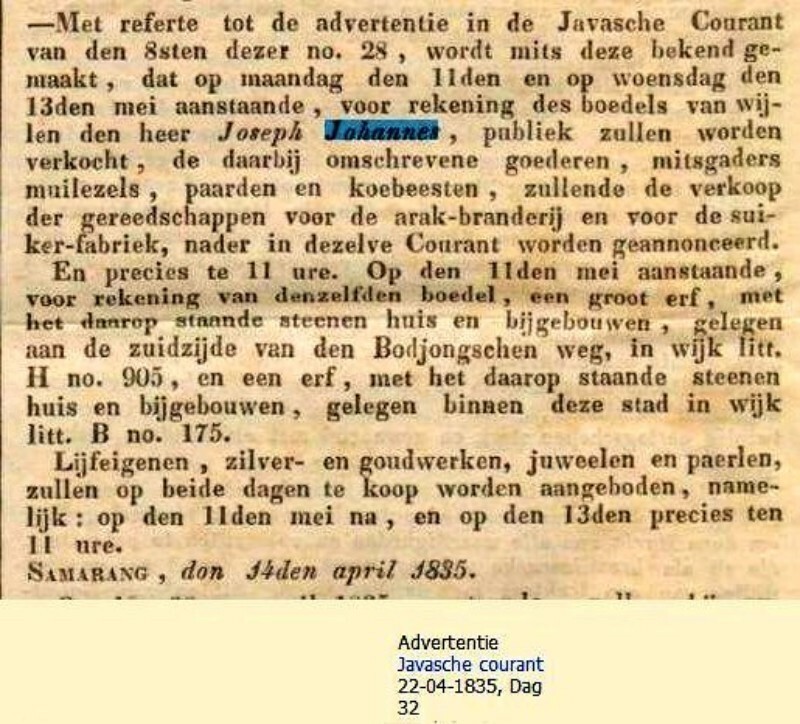 In the age over 56 years in the year March 1835, meaning that he was born in 1778. 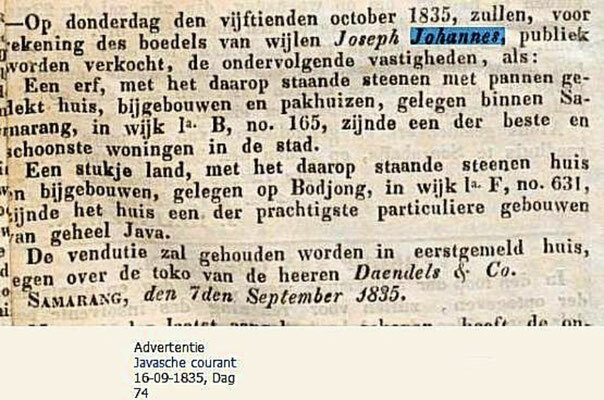 Married more then 22 years, meaning that he was married in 1812/13. 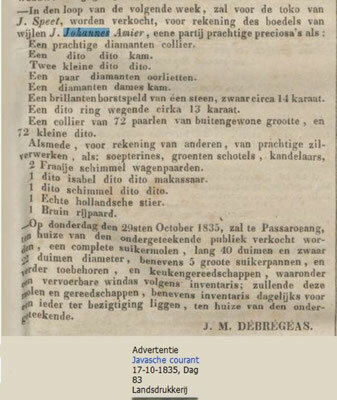 A disease on or about 7 months, meaning that this disease started aug/sept 1834. 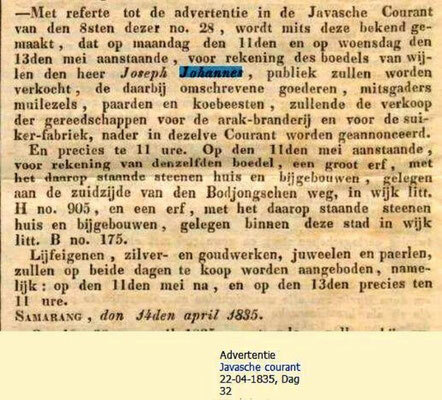 Dated 25th March 1835 "Hedenmorgen" meaning "This morning". I assume that the family had the night before been fullfilling their Death Watch at Agha Hovsep's. 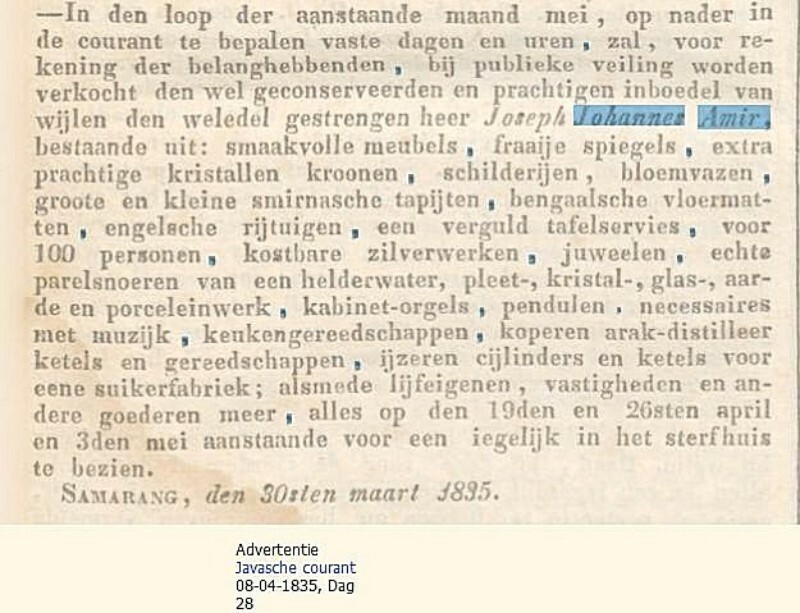 (*Public Notary van Heel The Hague 1952). War broke out in 1942 in Indonesia and 2 of Anna's youngest grandsons were captured into Japanese internment. 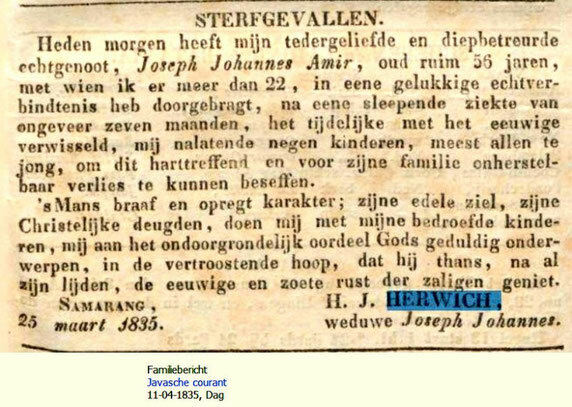 One grandson survived but suffered a lot and died due to internment injuries in 1948 in Holland. The second grandson did not survive the internment and died 1944 in internment. His body was provisionally buried in the yard of the internment camp. He was this editor's father. Both grandsons did not inherit their shares/parts of Agha Hovsep's capital. 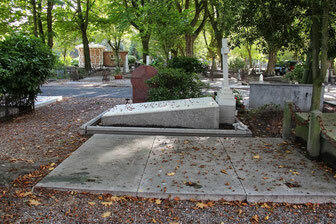 Anna's grandson who died in Holland is buried together with Anna's daughter Cornelia in The Hague together with her husband Julius Boers in one thomb. 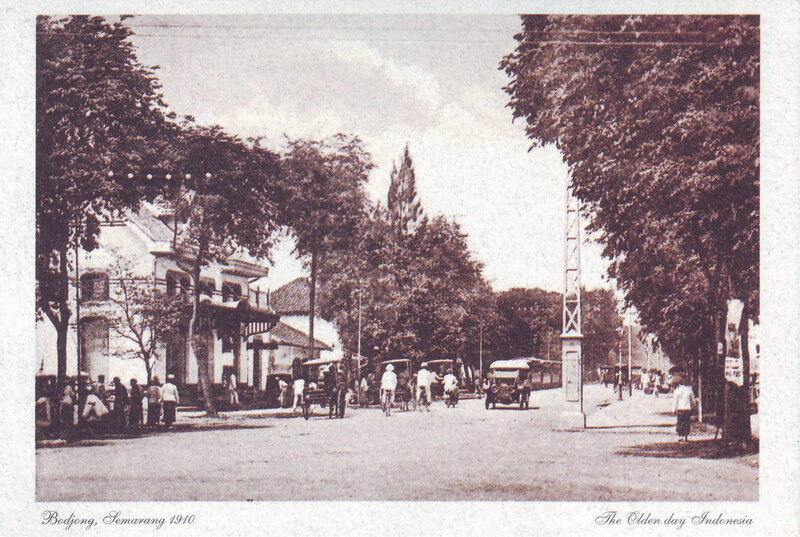 My father was reburied after the war in 1949 in the European Graveyard at Kediri, but this graveyard is demolished in the 1970's. My father now resides on top of the Kelud Mountain and watches over the horizon to the remnants of the thomb of his great-grandfather. I said hello to my dad in dec 2010 and also to my mum who is laying some 100 km's away from my dad's resting place. After the death of Agha Hovsep, his wife and the young children moved to this street in one of those houses as shown on the picture. 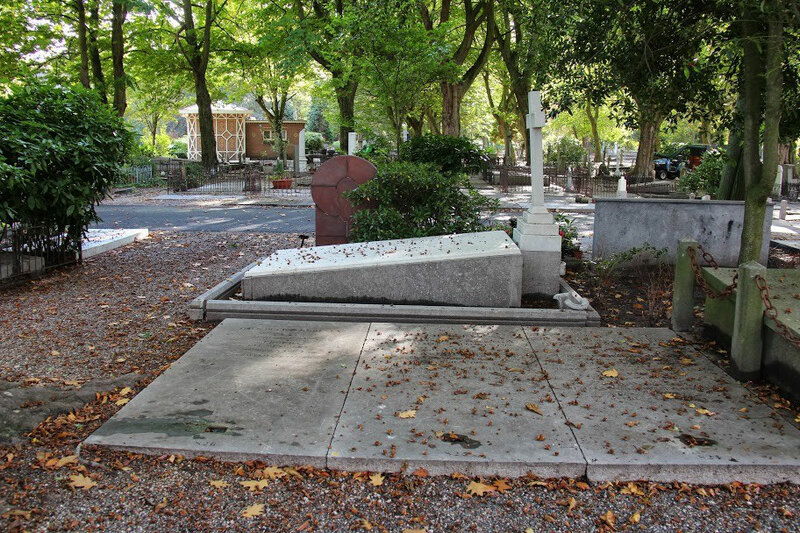 In the shade of summer leaves, one of Agha Hovsep's grandchildren Cornelia is resting here In the thomb at The Hague and she rests together with her husband and second youngest son Henri Constant. Cornelia my grandmother died 1904. Julius my grandfather died 1923. Uncle Henri died in 1948. Go to the mainpage of Khachatur Dadayan. One will find in Armenian language detailed articles as written by him about Agha Hovsep.